I had limited time to visit this ancient Benedictine abbey in the centre of Florence, which is more than a thousand years old. We had to catch our train back to Rignano sull’Arno, so I had to hurry. My visit to the Badia Fiorentina was further complicated by the fact that it is still actively used for religious purposes. The abbey is currently administered by the Monastic Fraternities of Jerusalem, an order founded in France in the 1970s. A nun was praying and, although the church was open to visitors, I did not want to disturb her by walking around, so I kind of stayed at the back. The Badia is interesting from a historical point of view, but hardly awe-inspiring and there is not much art to discuss. A short post will do the building justice. The history of the Badia Fiorentina goes back to 978. The abbey was founded by Willa, who was the widow of Hubert, Margrave of Tuscany. This is a period in Italian history that I am not intimately familiar with. Hubert (or Uberto) was apparently the illegitimate son of King Hugh (or Ugo) of Italy (924-947). The March of Tuscany had been created during the days of Charlemagne, so strictly speaking it would have been a province of the Holy Roman Empire when Hubert served as Margrave (with the Kingdom of Italy being a constituent part of that Empire as well). We can assume, however, that Hubert was able to act quite independently, as central authority was usually weak in this era. Margrave Hubert died in 969 and was succeeded by his son Hugh (or Ugo), also known as Hugh the Great. After his death in 1001, Hugh was buried inside the Badia. Much later, Mino da Fiesole (ca. 1429-1484) sculpted a monument for him, which can be admired in the left transept of the church. Interior of the Badia church. Monument for Hugh the Great by Mino da Fiesole. The church of the Badia was built on the plan of a Greek cross. It would originally have been a Romanesque church, but it was renovated and enlarged in the Gothic style between 1284 and 1310. Many sources attribute this project to Arnolfo di Cambio (died between 1300 and 1310), who was also the first architect of the Duomo. 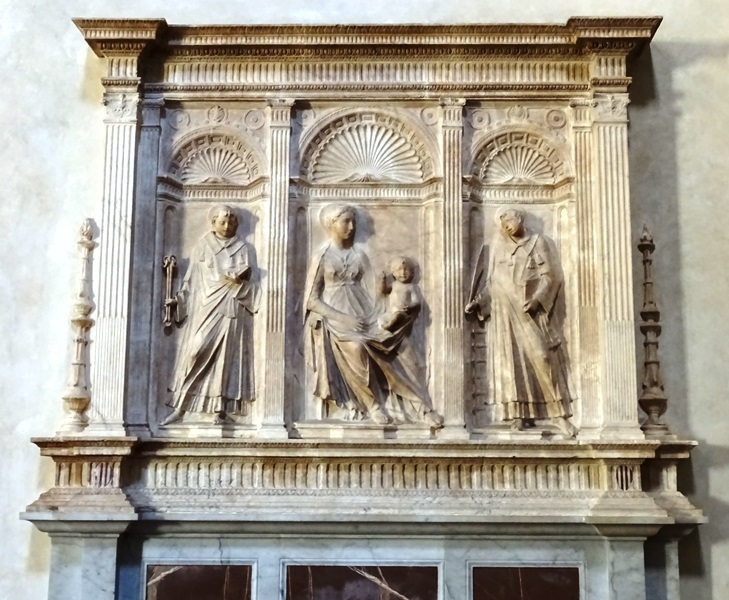 However, there seems to be a tendency to attribute just about any church in Florence built during this period to Di Cambio, so it is probably safest to conclude that we do not have absolute certainty as regards the identity of the architect. In any case, the church of the Badia was given a Baroque makeover between 1627 and 1631. Matteo Segaloni was the architect responsible for this project, yet he has remained relatively obscure. It is basically Segaloni’s church that we can admire today. 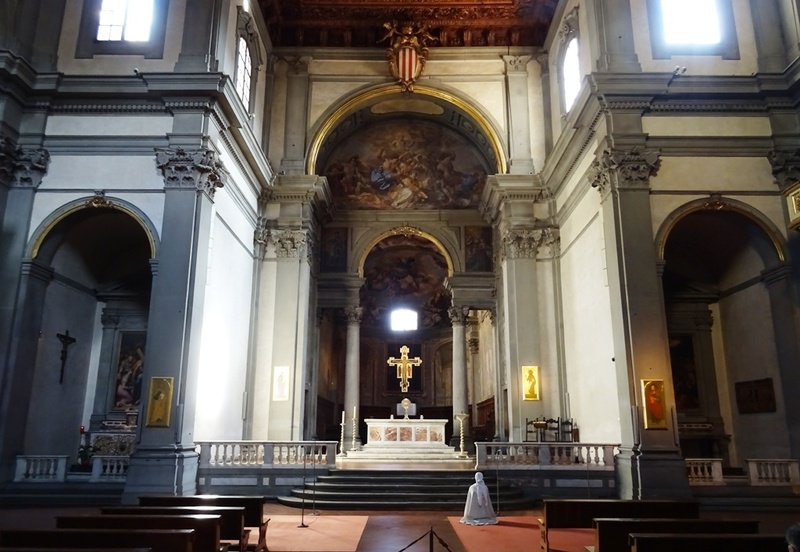 As I have stated previously, I generally dislike Baroque churches, but the church of the Badia has an interior that is not “overdone” (see the image above). The campanile of the Badia is a famous landmark of Florence. The lower part is Romanesque, while the upper part – built during the 1284-1310 renovation – is Gothic. The campanile plays an important role in Dan Brown’s novel Inferno: a mad scientist who has created a pathogen that will ultimately decimate the world’s population throws himself off the tower and falls to his death. This scene is included in the movie Inferno as well. 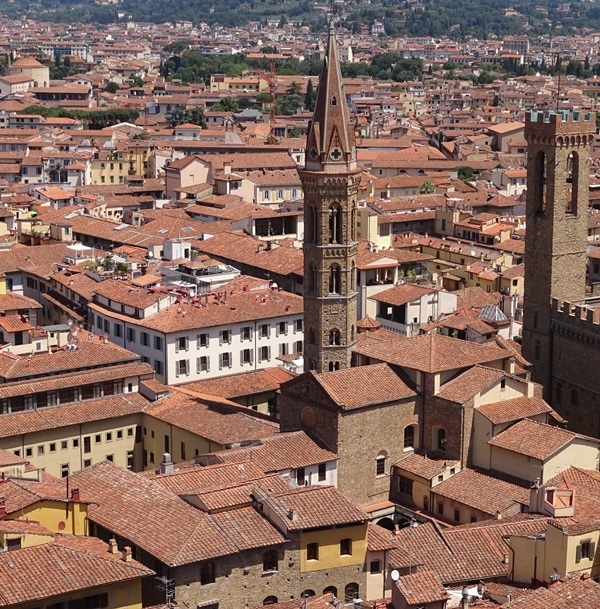 Note that the campanile has a spire, which is quite rare for Florentine bell-towers. Perhaps the most important piece of art once in the Badia is no longer there. The so-called Badia Polyptych, attributed to Giotto and painted around 1300, has been in the Uffizi museum since 1957 and had probably already been removed from the Badia centuries before. It may have been taken away during the 1627-1631 renovation, when frescoes in the church by Giotto and Masaccio were regretfully destroyed. The large altarpiece – the panel is 337 centimetres wide – shows the Madonna and Child in the centre, flanked by – from left to right – Saint Nicholas, Saint John the Evangelist, Saint Peter (with the Keys of Heaven) and Saint Benedictus. Dossal by Mino da Fiesole. The monument for Margrave Hugh the Great in the left transept has already been mentioned in this post (see the image above). Mino da Fiesole, who sculpted this monument, was also responsible for the tomb of Bernardo Giugni, a famous lawyer and diplomat who died in 1456 and lies buried inside the Badia church as well. To the right of the main entrance is a third work by Mino, a dossal or altar screen showing the Madonna and Child and Saints Leonard and Lawrence. 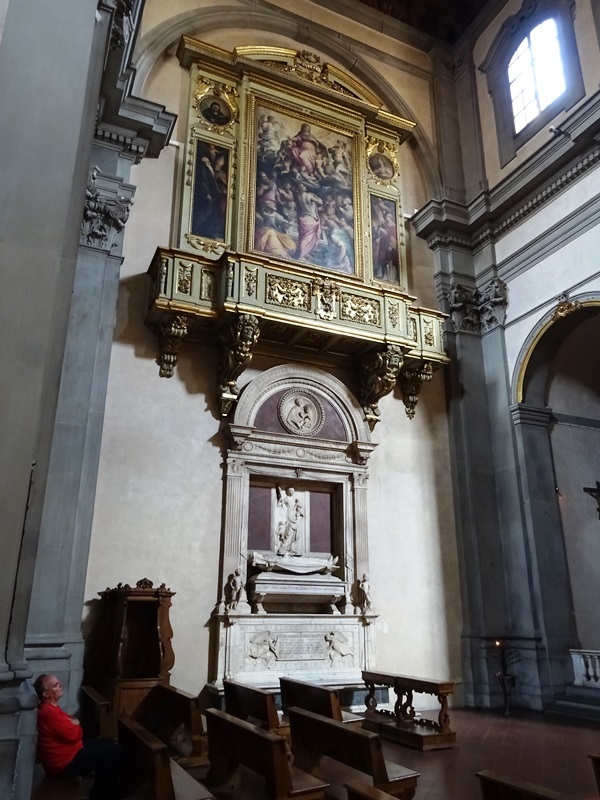 Above the monument for Hugh the Great is a painting of the Assumption and Two Saints by Giorgio Vasari (1511-1574). 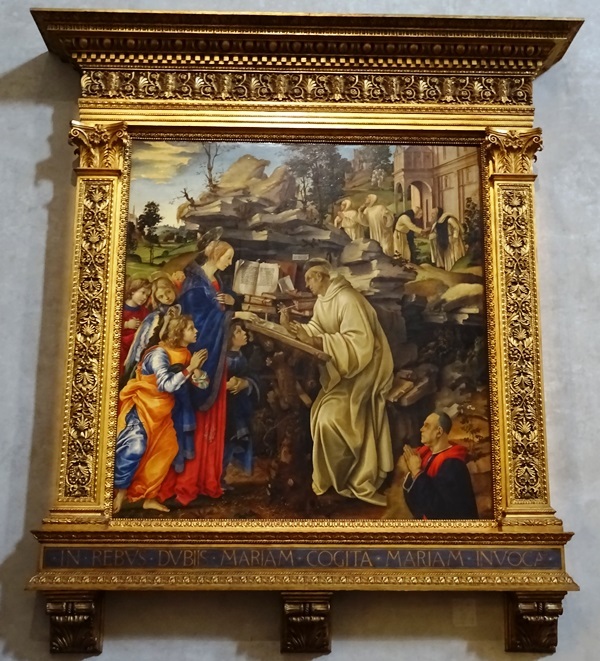 The artistic highlight of the Badia is a painting by Filippino Lippi depicting the Apparition of the Virgin to Saint Bernard. Lippi (1457-1504) was an apprentice of Botticelli, who was himself him tutored by Lippi’s father, Fra Filippo Lippi (1406-1469). The painting was originally commissioned for the church of Santa Maria del Santo Sepolcro, which was outside the city walls of Florence. It had been painted between 1482 and 1486 for the Del Pugliese family chapel and we can see a praying Piero del Pugliese (ca. 1430-1498), who hired the services of Lippi, in the bottom right corner. The church was heavily damaged during the 1529-1530 siege of Florence and Lippi’s painting was therefore transferred to the Badia. Apparition of the Virgin to Saint Bernard by Filippino Lippi. It is a very elegant and colourful work of art. We see Saint Bernard of Clairvaux standing behind a lectern, apparently in the process of writing. Above him is the Latin text “SVBSTINE ET ABSTINE” – bear and forbear – which is a maxim from the Stoic philosopher Epictetus (it is ἀνέχου καὶ ἀπέχου in Greek). The saint seems to be getting a surprise visit from the Virgin, who touches the pages of the book on the lectern. Above Del Pugliese is a little devil that is biting his chain. It is flanked by an owl. The background is very detailed. We see a rocky landscape, monks and a monastery, among other things. Part of the Badia complex is the Chiostro degli Aranci (Cloister of the Oranges), which was closed when I visited the abbey in June 2016. The cloister was designed by Bernardo Rosselino (1409-1464) and built between 1432 and 1438. Apparently there are many frescoes there well worth seeing. The best day to visit the Badia is – according to this usually reliable website – a Monday, when the cloister should be open between 15:00 and 18:00.